I have attempted to collect as much information about Used Rolls as I could. And while not complete, this page should answer many of the questions that I get asked repeatedly. Since I don't buy or sell used rolls, I'm not the best person to ask about value or rarity. I have located and provided 'mailto' links to the individuals who wrote the letters and articles below. A website with a Searchable Archive, the Mechanical Music Digest (click credits) has many megabytes of information about used rolls, recut rolls, roll styles, roll manufacturers, dealers of numerous types of rolls, roll history and many other topics. We also provide a listing of roll makers and dealers on the Comprehensive List of Roll Manufacturers and Suppliers Page - click here. These are the Basic Questions that Dealers, Collectors and Auctioneers need to have answered BEFORE they can adequately help you determine the value of your rolls. This excellent list was compiled by Paul A. Johnson. 1. How many rolls do you want to sell? 2. What color are the boxes? 3. Do you have a sense of their age? 4. What seem to be the 4 - 5 most prevalent labels/manufacturers. The name of the manufacturer is usually listed at the top of the roll. 5. What are the 4 - 5 most prevalent music types? For example, classical, fox-trots, one steps, waltzes, etc. 6. What condition are they in? (a) Do they have their original box and label? (b) Can the box stand up on its own? (c) Is the correct roll in the box? (d) Does the roll have an end tab? (e) What condition are the left and right edges in? One of the problems with dealing with rolls is that they tend to hide their defects. Here's how you can check for edge condition. As the tab falls over the top of the roll, the flange on the left will usually twist off. Once you've removed it, check the left edge of the paper. Does the edge look clean and crisp or is it ragged and appear torn throughout or in places? Now reverse wind the roll, kind of like you're opening a jar, tilt the right edge up and let the paper fall to the left side (with the left flange still removed). Then check the condition of the right edge. If it looks okay after this inspection the roll is probably okay. Try to have a sense of what you want for the rolls before contacting a buyer. Many times when I ask a seller what they want for their collection, they will tell me they have no idea. Then when I make an offer and they say "that's not really what I had in mind," it shows they had ideas to their value all along. Also, beware of relying on antique store prices. Usually antique stores deal with rolls infrequently so the price they put on them can vary widely. Just because an antique store has a certain price on a roll, doesn't mean that that's what they're selling for (they may have been warming that shelf for an awfully long time). I'm interested in the rolls you mentioned in the 7-23 MMD, especially if they're Duo-Art. I can tell you if they're of any special value if you'll email me with some details, and I do collect rolls so I might be interested in buying. Value typically depends on rarity, roll type, condition, and quantities for sale at once. I live between Chicago and Milwaukee in Grayslake, IL. Drop me a line! Bob has also written an article on Roll History that is very informative. We run a roll punching machine which can make each roll which is known in the moment. When you put together your web page for roll exchange, include us. and are interested in both buying and selling. to be played alternately on an AMPICO and ArtEcho). Right now our primary buying interest is Telelectric (65 note) and Telektra (88 note). as we are in the process of creating another Rollography volume that will include Telelectric. For those interested in Nickelodeon rolls, contact Don Rand, Telephone 207-354-8033 in Thomaston, Maine. Or visit his site at: http://www.home.earthlink.net/~rollertunes. We have been doing roll auctions under the same name, continuously, longer than anyone else who is still in business! We put out lists of 300 or more rolls, several times a year, allowing people to bid on just the rolls they want. People can get on our list by calling, mailing, or emailing their information. We can send printed copies in the mail, or by email. To download the latest listing, go to: Rag Daddy's Roll Auction -click here. 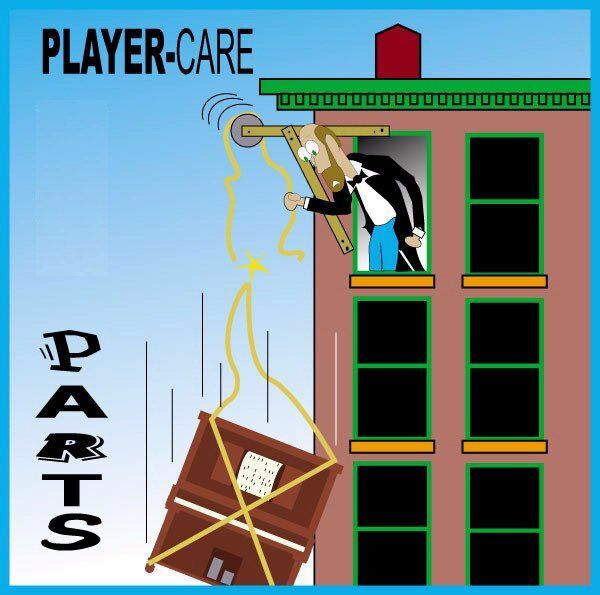 NOTE: Player-Care is in no way involved with this company. So, do not write to or call us for information. The recent exchanges concerning music roll auctions and, in particular, the demise of the QRS auction service, prompts me to remind MMD readers that The Player Piano Group's new and second-hand roll auction service "PostBid Plus", the longest established specialist roll auction service in the UK, continues to go from strength to strength. Our current catalogue (No. 59) contains nearly 700 lots and features many interesting roll types such as Duo-Art, Ampico, Welte Licensee, and "Green" Welte, plus Aeolian 58-note and 116-note organ rolls. We are also offering this time a good selection of ragtime, blues and jazz piano rolls. Although primarily operated as a service to members of the PPG, PostBid Plus is also open to non-members worldwide, on a simple subscription basis. Our current charge is ?3.50 per year (3 catalogues) for UK subscribers; overseas subscribers will be quoted for individually. As a special offer to MMD readers, we shall be pleased to send a free copy of our current catalogue by e-mail to anyone who sends us an e-mail request to postbid.plus@boltblue.com. Here is my latest roll auction. Please let me know if you have any trouble getting to the PDF. You can email bids to this email address: "dan@pumachemical.com"
addresses. I apologize. I have recently updated my list. Please let me know if you received it from an old address. Solution: Secure the left flange so there is a small amount of free space between the paper and the flange. One of the most common problems that people run into when attempting to play an old roll occurs during rewind. Quite often the roll rips wildly for no apparent reason. However, there is a very good reason why this happens. Most player piano owners know that the flange on the right of the roll is permanently secured to the cardboard tube upon which the paper is wound. However, many are not aware of the fact that the left flange is normally NOT secured. It is normally free or 'loose'. Furthermore, upon inspection it will be found that the cardboard tube is not as wide as the paper itself. These two situations, along with the fact that the paper has become brittle with age, are most often responsible for the damage done to the roll when it is rewound. The problem is compounded by the fact that the mechanism that 'holds' the roll into the spoolbox is spring-loaded on the left side. That spring is always pushing on the left flange. If the flange is loose, the spring will actually push the flange past the left edge of the paper (at the very end of the play cycle) creating a situation where the paper is actually wider than the space between the two flanges. (This can happen because the cardboard tube is almost always narrower than the paper.) The result of this situation seems pretty obvious. The paper won't fit. When the roll starts rewinding, the paper starts curling at the edges and it can rip because it's being forced into an area that is too small. The simple solution to the problem (as stated at the beginning of this article) is to secure the left flange in such a manner that the paper has a little 'breathing room'. The easiest way to accomplish this simple task is to take the left flange off before playing the roll, hold the roll upright and knock the right flange on a hard surface (forcing all the paper towards the right flange), take a piece of scotch tape and apply it to the left flange (the part that goes into the cardboard spool) and insert the (slightly fatter) flange back into the spool, leaving about 1/32" of free space. That's it. If the rolls continue to rip on rewind, that indicates an imbalance problem with the tracking mechanism and a technician should be called in to repair the problem. This is a fairly common problem in Standard players with horizontally mounted tracking bellows. One way to help delay or prevent this problem from occurring in the first place is to LEAVE A ROLL IN THE PIANO AT ALL TIMES. Here's a few quick words about roll care that come from QRS Music Rolls. The following is written in the top half of every new QRS music roll and concerns what's known simply as "Knocking The Roll", "FOR PERFECT TRACKING: First, see that the music roll is loosely wound on the spool, then hold the roll in your hand with the SLOTTED end facing DOWN. Let the roll drop lightly two or three times against a hard surface, thus throwing the entire music sheet against the right flange. The roll is now ready to be played. DO NOT TIGHTEN THE ROLL!" 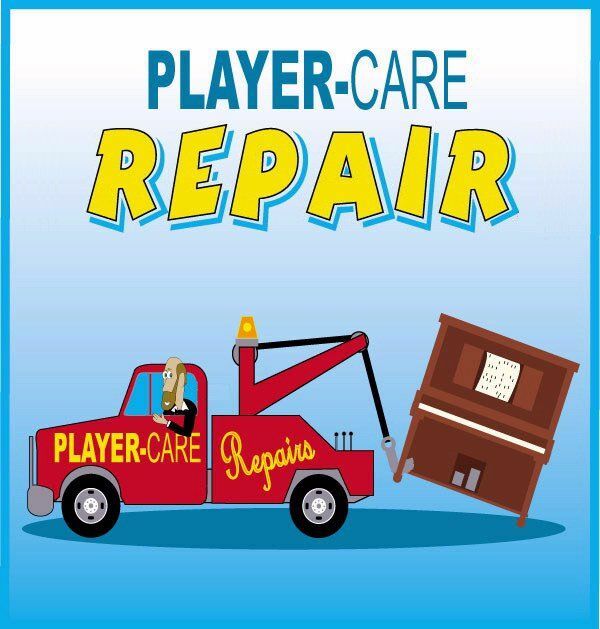 Also, as a player piano technician, I always suggest that owners "Pump The Bar" at least every Eight Playing Hours. This process is explained in detail on the web page called "Using the Trackerbar Pump: The 'Kissing' Technique"
For new information (Jan 17, 2006) about Repairing Ripped Rolls - Click Here!! For information about replacing missing roll labels - click here! Music Roll Repair Method by John Taber - click here! I was one of the lucky ones to get some of the rolls from the Tushinsky music collection sold by Butterfield & Butterfield recently. A friend attended the second day of the auction after hearing of the low bids of the first day and succeeded at getting about 700 of the Duo-Art rolls. The Ampico rolls were almost given away. I am now neglecting other responsibilities to listen to the 171 Duo-Art rolls that I got. There is some rare and wonderful stuff. I wish I had been there to at least see the other rolls and maybe mortgage my house to buy them. Some of them should be showing up on the auction lists soon. The only problem with the rolls is that they were stored for a long time with rubber bands applied. The rubber turned to gum and stuck to the leaders. I am posting this as a warning to others to not repeat this mistake. It is a good idea to exclude air from the roll paper, but something other than cheap rubber bands must be used. Does anyone have an idea as to what would be a long lasting and non-reactive elastic for this purpose? Would butyl rubber from bicycle inner tubes be safe? What about pure latex from the very expensive racing bicycle inner tubes? Self-adhesive, extremely thin, transparent special paper for invisible mending of torn pages and documents. Produced according to the newest principles of the preservation of cellulose fibers...pH 8.7, aged: pH 8.4. It is extremely thin and has a paper backing that you peel off. It is somewhat repositionable, but it also stretches due to its thinness. I find it is a wonderful substitute for Scotch tape and (egad!! what my parents used to use) adhesive tape! As Light Impressions is an archival house, I believe my repairs will last longer with this tape. It isn't cheap; 3/4" tape is $19.85 and 1-9/16" is $28.70 per roll. Call toll-free at 800-828-6216, or e-mail is www.lightimpressionsdirect.com. Thanks for the tip about the glass, Dave Fogle. I have a lot of my grandparents' original 1923 rolls that need repair and I think your idea will help immensely! I've been contemplating a Velcro strap. I just haven't gotten the motivation to put one together. As an archivist I'd be doubtful about having any elastic compound in contact with paper for a long time. I would prefer to use unbleached cotton tape to tie round rolls with the minimum risk of contamination. How do you care for the storage of music rolls? bad for paper. And, if you have bugs, call an exterminator! "Repairing Wrinkled Rolls" -- what a fine example of alliteration that is, Jim Canavan; it rolls off the tongue beautifully! And I'm pleased that someone has brought the problem up. It's really disappointing to acquire a desirable roll in apparently excellent condition but which plays a few unwanted notes in the treble or bass. This usually happens right at the end of the roll, just as you are letting out the breath that you've been holding all through the roll's first playing. Sometimes the extra notes (ciphers?) occur right at the start of the roll. Then you are disappointed immediately. I think that the problem occurs because the roll paper has been stretched on the side where the ciphers are. My guess is that the damage is caused by the roll not being wound up properly, and left that way for many years. In my limited experience, ironing a roll improves creases and wrinkles considerably, but won't help fix problems due to stretched paper. None of this helped. In desperation I cut the stretched sections out and replaced them with paper salvaged from another roll, but by now the section of music had been so abused that the ciphers _still_ sounded. 1) Let the section of roll with stretched edges hang vertically, and clamp it firmly at the top. 2) Clamp a heavy weight to the roll at the bottom of the stretched section. I envisage two pieces of wood with felt glued to them that clamp right across the width of the roll. This should produce a uniform tension in the roll paper everywhere except where the roll is stretched. The tension there should be close to zero. 3) Increase the humidity until the roll paper begins to relax and stretch. It should stretch permanently where the tension is high but not where there is no tension. You might end up with a slightly longer roll but one with no ciphers in it. No doubt everybody can see boundless possibilities for disasters here, like ripping the roll apart. Obviously the tension would have to be chosen carefully, probably after a few accidents. The hanging weight would need to have supports a few millimeters below it to stop the paper stretching too far. Several years ago I exchanged letters with a paper conservator and I got the impression from her that one could actually wet the roll paper without permanent damage; I think she suggested spraying it with an atomiser. This sounded so alarming that I wasn't game to try it. But I'll get back to her. I must make it absolutely clear that I'm not suggesting that anybody else tries the above idea before I do; it is very much untried! But if anybody has got any comments or thinks it's just crazy I'd be glad to hear from them. Paper buckles, not when moistened, but when the moistened area has dried again. Why? It's as though moistening the paper releases internal forces, allowing the surface area to grow. Then it bulges slightly, and causes ciphers at the tracker bar. I've used a steam-iron cautiously to "tame the music", and it seemed to help, perhaps because the water vapor permeates the region equally, bad and good areas alike. I've not ironed the dampened paper with a dry iron, but this seems logical to try, too. A surfactant, such as Kodak "Photo Flo", might aid even-penetration of the moisture. John Phillips proposes applying tension to the hanging web of paper, to force it to become flat again. That seems a good idea; more than 50 pounds tension should be possible without rupture if the edges are good. Try introducing the moisture with the steam iron, too. Don't worry about overall-stretch in the roll.
. Here is a link to a listing of companies and individuals who sell new, used, and re-cut rolls. Those who sell used rolls have to get them someplace. So, you might want to contact those concerns before using eBay or CraigsList to sell your rolls. While they might not offer you as much as you could possibly make, it would certainly save you a lot of time. Here's the link. "music rolls". Sell them in sets of no greater than five (5) rolls. them via USPS MEDIA MAIL (within the US only. There are over 1100 lots for 58, 65, 88-note and reproducing formats. the catalogue and, if you are not a member, why not consider joining. request for the identity of the Perfection Roll. the piano roll box label making program by John Miller. can produce new totally authentic labels. to Tom Hutchinson, 15361 Hopper Rd, Sturgeon MO, 65284.
roll looks, it is probably a good indication that it was played a lot. - Select the "advance search" link. - In the left column is a choice to find "items by" and chose seller. - Type in "jensprank" and be taken to her offerings at the time. I have no financial interest here, just helping the family. the Editor, Jody Kravitz or Associate Editor, Robbie Rhodes. Now Playing: "History" by John A. Tuttle, recorded in the Summer of 94. This page was last revised on October 28, 2009 by John A. Tuttle. If you wish to have your contact information removed, please contact me immediately via this special link here.